Aloha! Our trip to the Big Island of Hawaii was a short but enjoyable escape from slushy Vancouver. With such diverse geology and biology in one BIG island, there was so much to explore. Highlights included the windy lava fields of Hawaii Volcanoes National Park, snorkelling in crystalline Kealakekua Bay, and stargazing at over 13,000 feet elevation on Mauna Kea. While in Hilo, we also visited the Mauna Loa Macadamia Nut Factory to purchase the requisite teal blue tins for friends and family. Meanwhile, I may have overdosed on pineapple juice during my stay but I needed all the Vitamin C available to me to nurse my cold. With so much pineapple and macadamia nut surrounding me, I could not refrain from dreaming up dessert ideas with these two ingredients in mind. I had bought a pound of ground toasted unsalted macadamia nut which could be used in a million different ways but I decided to make macadamia nut financiers to be served with a roasted pineapple and mint salsa. Next, I made macadamia nut roca which was crumbled to support a scoop of caramelized banana and Malibu rum ice cream. So good, I must admit. Finally, presented in a glass, my version of a "Shirley Temple" gelée (orange-pineapple juice with grenadine) contrasted with a creamy coconut milk pannacotta. To anyone out there who is biochemically inclined, fresh pineapple juice actually does not set with gelatin because of bromelain, a protease found in pineapples. Heating the juice first solves this enzymatic dilemma. This impromptu plated dessert exercise also gave me an opportunity to pull out my souvenir glass from Pierre Hermé which previously contained his Sensation Satine. 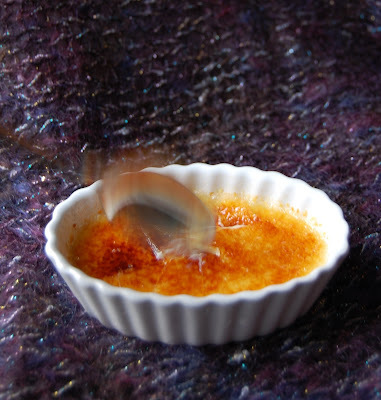 It seemed appropriate since this dessert was the finale to a Parisian themed night which I shared with a good friend (okay, more like Ratatouille the movie themed night). Whatever the excuse, it was a pleasure to get my creative juices flowing once again. Happy New Year! The past few weeks have been reminiscent of my university days, filled with concentrated mental and physical effort of December exam time which is quickly followed by viral illness during the subsequent holiday period. I was able to valiantly fight off a cold while working this Christmas but as soon as relaxation was imminent, my immune system seemed to be the first one out the door. Regardless, we had a lovely getaway which provided new flavour inspirations that I will hopefully showcase next week (stay tuned!). 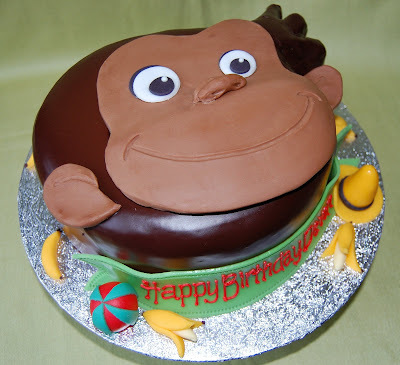 Within an hour of returning home from my holiday, I had to begin thinking about cakes again, in particular, a Curious George birthday cake for three year old Devon. Instead of fondant, the obvious choice for decorating this inquisitive primate was chocolate and so ganache glaze and chocolate modeling paste were used. Inside, three layers of chocolate cake surrounded caramelized bananas and whipped ganache. Chocolate modeling paste is a very versatile medium that is easy to make and tastes so much better than fondant. My sculpting skills are minimal but I think George's nose is a reasonable replica. Beauty is in the details and as always, my favourite items were the tiny fondant bananas, yellow hat, and ball. Finally, I have been so busy with birthday cakes that I have not wished my little blog a Happy 1st Birthday! It is a work-in-progress which has been a source of pride and at times, catharsis and I humbly thank you for following my personal journey with me.